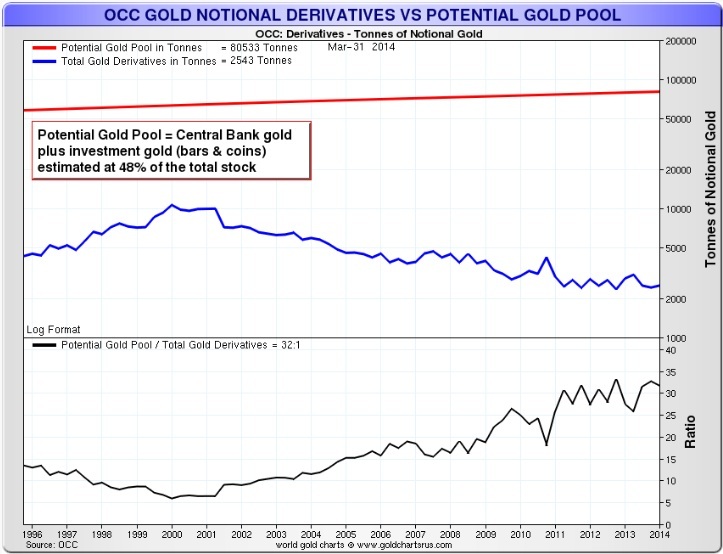 We can’t speak about the manipulation of the gold price today without understanding the derivatives market. Right after the crash of 2000 in the stock market I became alarmed by the exponential increase of derivative products but especially by the complexity of those products. I am sure that if I asked one of those financial engineers who has designed those products to explain their functioning and consequences in a bear market or, better yet, in a crash, he would be incapable. We are familiar with derivatives in real life through cars. When we speak of the speed of a car we talk of a first derivative, while acceleration, an increase of the speed, is a second derivative. But in finance we have gone well belong that to third, fourth and even higher derivatives. Those products have never been tested in the real world and especially in adverse conditions as a major crash. I concluded then that the next financial crisis will have derivatives at its core. The 2008 crisis confirmed it to some extent. The next crisis will be much worse and it will also have derivatives at its core. In the gold market derivatives are presently dictating to the physical market what the price should be whereas by definition, as derivatives, they should be derived from prices set in the physical market. 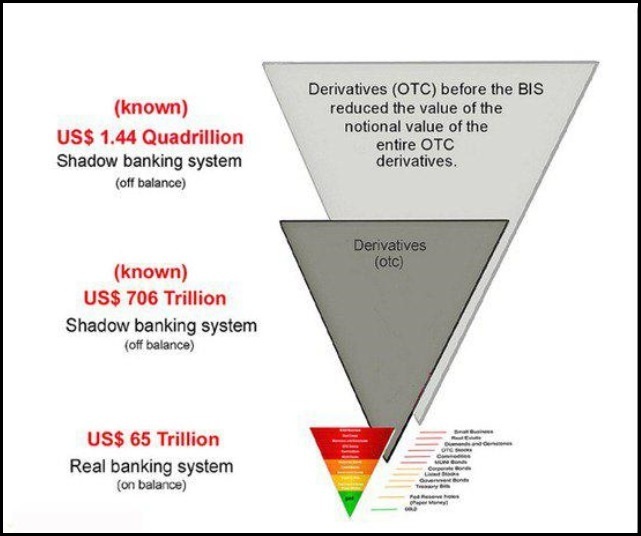 The two diagrams bellow show an approximation of the size of the derivatives market supported by the real market but not its increased complexity and opacity. In a recent and excellent book on gold price manipulation, The Gold Cartel, Dimitri Speck explains how central banks and bullion banks are manipulating the price of gold with derivative products in a very opaque way. Central bank accounting for gold is rather peculiar: gold receivables and bullion still in their vaults are treated as a single line item in their balance sheets. This makes it almost impossible for outsiders to ascertain how much of their gold is actually on loan. Central banks use inter alia the alleged need to protect the trade secrets of their business partners as an excuse to avoid publishing the data. Dimitri Speck describes how, through a carry trade, gold is loaned by the central banks and the proceeds invested in higher-yielding instruments in order to profit from the interest rate spread. The borrowed gold must be first sold in order for the proceeds to be invested in fixed income instruments. Dimitri Speck says that, “The gold carry trade is, thus, a special type of business, the only important one of its kind, where there is an exclusive interest in falling prices [of gold].” There exist barely any authoritative reports on gold carry trades. But there are dangers in a major financial crisis, as we have witnessed in 1990 with the collapse of Drexel Burnham Lambert. When the investment bank went bankrupt it was unable to fulfil its gold obligations to the central bank of Portugal. This is how Portugal lost the gold it had previously lent to Drexel without collateral. Dimitri Speck quotes also Alan Greenspan who in 1998 said “Nor can private counterparties restrict supplies of gold, another commodity whose derivatives are often traded over-the-counter, where central banks stand ready to lease gold in increasing quantities should price rise.” By saying this he spells out clearly that the central banks are lending out gold in order to keep the price from rising. Nick Laird (Sharelynx.com), has prepared some very interesting charts on the gold derivatives market. 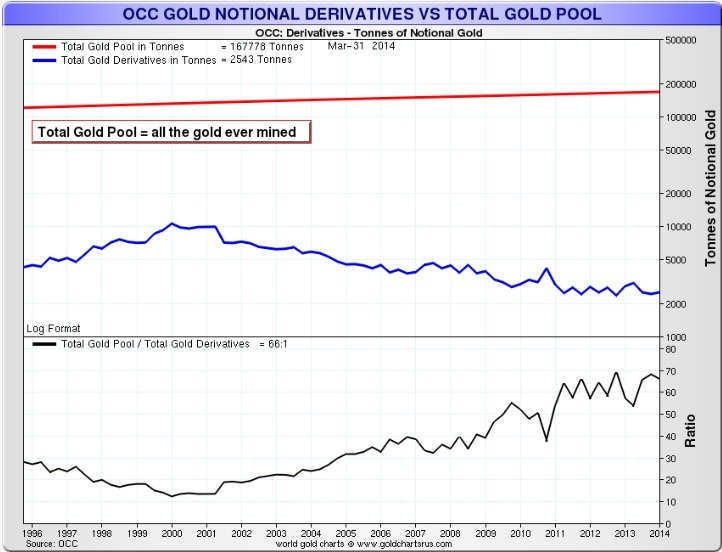 In chart #1 we have the ratio of total (all the gold ever mined) gold pool versus gold derivatives in tonnes which, as of March 2014, stood at 66:1 and, in chart #2, he shows us the potential (central bank plus investment) gold pool versus total gold derivatives in tonnes, which was, as of March 2014, of 32:1. The ratios have increased substantially since the beginning of the gold bull market from 10 to 66, for the total gold pool, and 5 to 32 for the potential gold pool, showing a decrease in gold derivatives as price increased. Some commentators have said that as much as 100 times as much paper or digital gold is bought on commodities exchanges such as COMEX, as there is traded in actual delivery of physical gold. What this means is that if all parties asked for delivery it would be impossible for the warehouses and the short players to actually meet their obligations, and someone would be left standing out. Some futures traders refute this argument by saying that COMEX only delivered a minute fraction of physical gold represented by this exorbitant short position because no institution asked for substantial physical delivery of their long contracts. While it is true that less than 1% of most commodity futures contracts are ever settled by physical delivery, in a financial panic this can change drastically and fast. Those who today argue they understand the game and will not ask for delivery will, in my view, be the first in line with several lawyers trying to salvage as much as they can, ignoring what they have preached for years. This is human nature and we have seen it play out several times when a catastrophe actually happens. Those who have lived through the collapse of the Bretton Woods agreements and the run on the US gold reserves by world central banks know how fast things can degenerate in a crisis and the snowball effect that it creates. 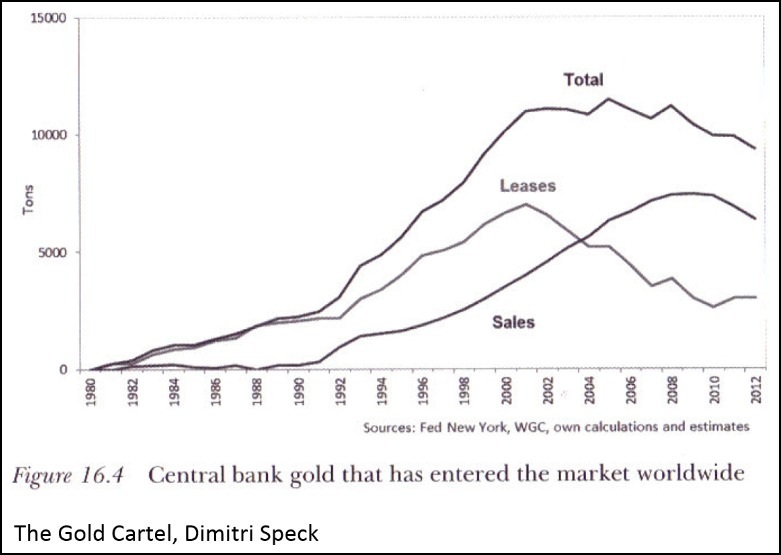 I highly recommend you read Dimitri Speck’s book, The Gold Cartel, to better understand the manipulation of gold’s price by central banks and bullion banks through gold loans and futures markets. Article written by Dan Popescu at GoldBroker.com. 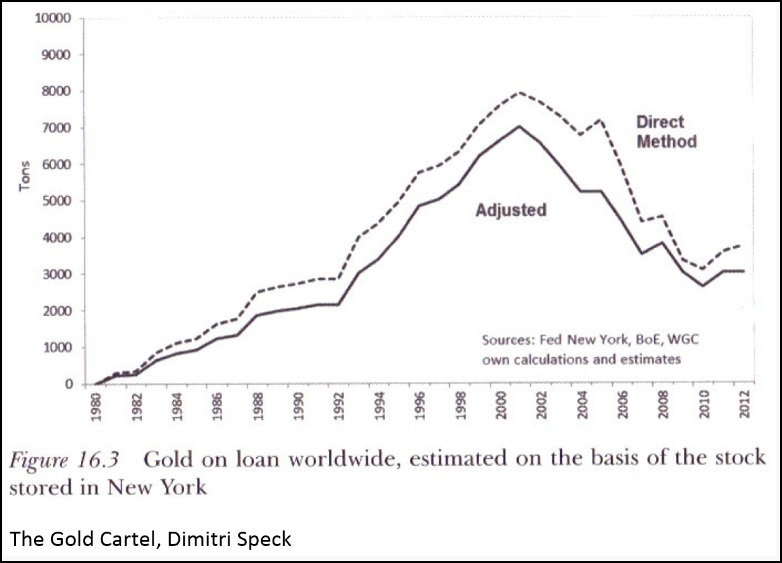 The original article can be found at this link: How Much Gold Is On Loan Worldwide?